On November 28, the country of Rwanda became a member of the Commonwealth. The Commonwealth is a group of over 50 countries that are former British colonies and territories – in other words, they were part of the British Empire at some point. However, there are two exceptions to this – Mozambique and now, Rwanda. The Commonwealth nations encourage economic development and trade amongst themselves, and also promote democracy, human rights, and peace. The head of the Commonwealth is Queen Elizabeth II, the Queen of the United Kingdom. Rwanda was not a British colony – it was ruled first by the Germans and then the Belgians. It is often referred to as the “land of a thousand hills” because of the many rolling hills in the country. It is also Africa’s most densely populated country – there are around 400 people living per square kilometer (that’s almost a thousand people per square mile). Rwanda has emerged from some very tough times. In the 1990s, a war broke out between two tribes in Rwanda – the Hutus and the Tutsis. This war caused the death of almost a million people! Many landmines were laid all over the country. A landmine is an explosive device, usually hidden just under the ground, which blows up when someone steps on it. Even though the war ended, people continued to get hurt or die as they accidentally stepped on landmines. The government has been working hard for years to remove all the landmines. Finally, earlier this month, Rwanda declared itself to be free of landmines! Last year, Rwanda became the first country in history to have more women than men in parliament! 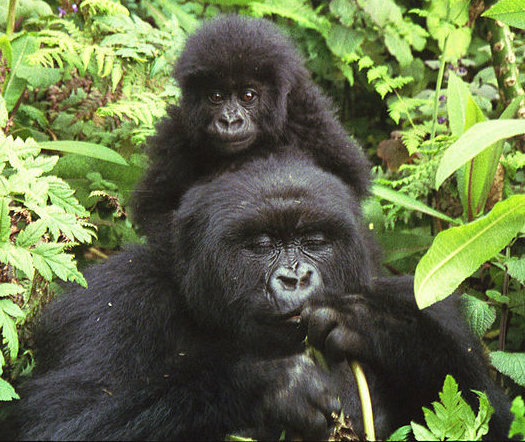 Rwanda also annually celebrates a baby mountain gorilla naming ceremony called ’Kwita Izina’. This year, 18 baby gorillas were named.